Great replacement for C2000 (Quad) Inlets! 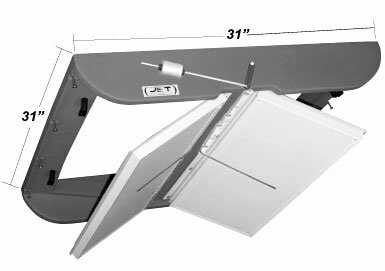 The JD2900 Two-Sided Ceiling Swine Inlet has two frictionless styrofoam lids on a continuous PVC hinge that swings down to access the main room to distribute clean attic air. 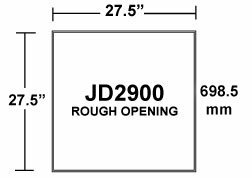 The JD2900 Hog Inlet lids are fully insulated to minimize condensation, dripping, or freeze-up of inlets. Long life PVC flexible, noncorrosive, and non-binding hinge. 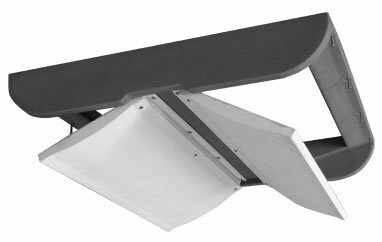 The JD2900 Two-Sided Ceiling Swine Inlet, made specifically for hogs, has two frictionless styrofoam lids on a continuous PVC hinge that swings down to access the main room to distribute clean attic air. The JD2900 Hog Inlet lids are fully insulated to minimize condensation, dripping, or freezing of inlet. Long life PVC flexible, noncorrosive, and non-binding hinge. The JFD2900 Two-Sided Ceiling Swine Inlet, made specifically for hogs, has frictionless styrofoam lids on a continuous PVC hinge that swings down to access the main room to distribute clean attic air. 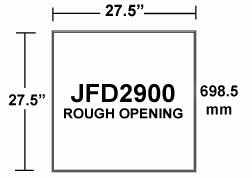 The JFD2900 Hog Inlet lids are fully insulated to minimize condensation, dripping, or freezing of inlets. Long life PVC flexible, noncorrosive, and non-binding hinge.